This story of patriotism, bravery abroad and at home, and most of all, deep commitment, sets in a gold frame the very essence of America. The story of G.I. Joe and Lillie helps us all remember that true love never, ever dies. In the early morning hours of June 6, tens of thousands of boys from the shores of Maine, the rivers of Mississippi, and the lakes of Minnesota were taking a boat ride that would go down in history. With the ocean spray in their faces and hearts practically beating out of their chests, American G.I.s peers through the mist and saw the beaches of France. The Allied invasion of Hitlers Europe was on! The 1944 D-Day landings preserved freedom all over the world and affected countless individual lives including G.I. Joe and his wife, Lillie. After the war, G.I. Joe and Lillie settled into a life that included two children. Old wounds, though, never quite let G.I. Joe leave France. Nightmares and crippling injuries left him with only one true friend, but she was all he'd ever need. Lillie embarked on a decades-long love affair, from the moment she saw that skinny boy from Philly in an army hospital. Five days of courtship and 55 years of marriage strengthened by faith saw to that. Lillie prayed daily for her husband and children in the difficult years ahead. Together, they made it all the way home. In Lillie's America, it was sacrifice that preserved cherished freedoms, and loyalty kept families united and strong. Lillie's steadfast faith and heartfelt devotion is a lesson for our time. About "G.I. 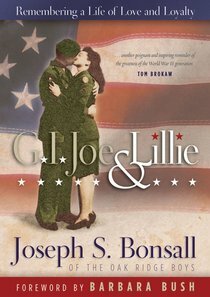 Joe & Lillie"
Joseph S. Bonsall is the tenor singer for the world renowned Oak Ridge Boys. He lives in Hendersonville, Tennessee, with his wife and four cats.